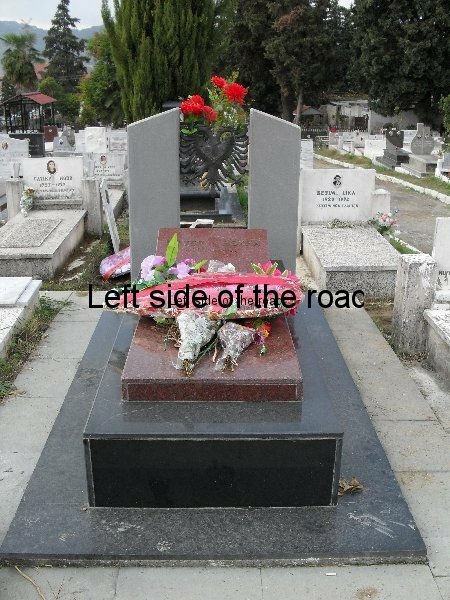 After his death on 11th April 1985 Enver Hoxha was buried next to the Mother Albania statue in the Martyr’s Cemetery overlooking Tirana. However, the counter-revolution that took place in 1990 allowed his political enemies to take their revenge by denying him a place of honour in the country’s history and he was reburied in the main public cemetery of the city. To get there take the bus to Kombinat, an orange and always crowded bus, from the top end of Rruga Kavajes, the road that leads away from Skënderbeu Square in a westerly direction. Cost of the fare is 30 leke. Stay on the bus and if you are the only one on and it heads back the way you came it is time to get off. Continue walking in the direction you were travelling until there is a bend in the road towards the left, by a petrol station. 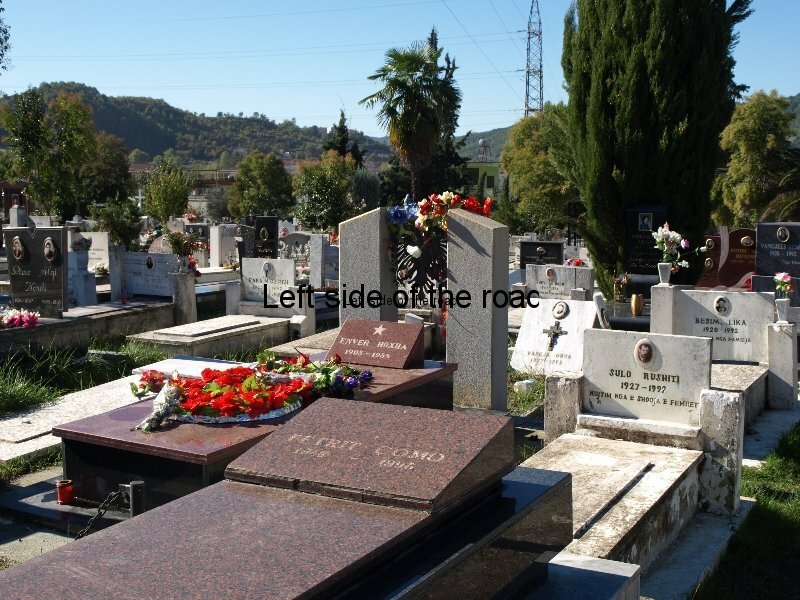 Cross over the main road and go up the side road that is lined with flower sellers and gravestone producers. Continue along this road for a few minutes until it turns to the right and in less than 50 metres go through the gate on the left. There are always flower sellers on either side of this gate. Once through the gates take the path to the left and then the first path, heading up hill, to the right. When you see a sign with ‘Parcela 6’ on your right you know you are getting close. 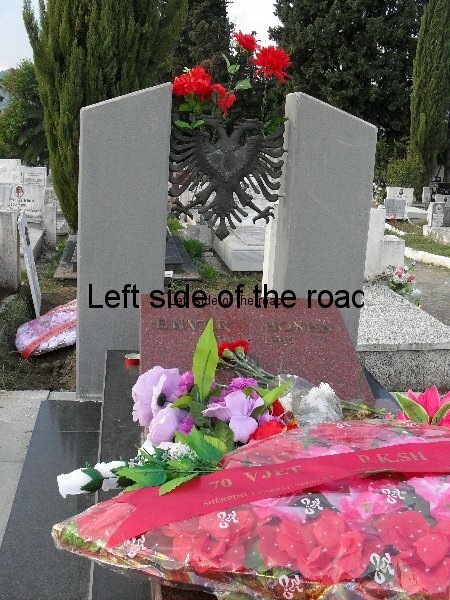 Look for the back of the doubled-headed eagle symbol, ubiquitous throughout Albania, and that’s where Enver’s remains currently reside. If you arrive at the same level as a second caged grave (presumably the relatives were afraid s/he would escape otherwise) you have gone too far. It’s a modest grave, two in from the path, of red marble and the only inscription being his name and dates (1908-1985), surmounted by a small star. At the head there are two pillars which support a black metal, double-headed eagle. There are always flowers on the stone, a mixture of real and artificial. 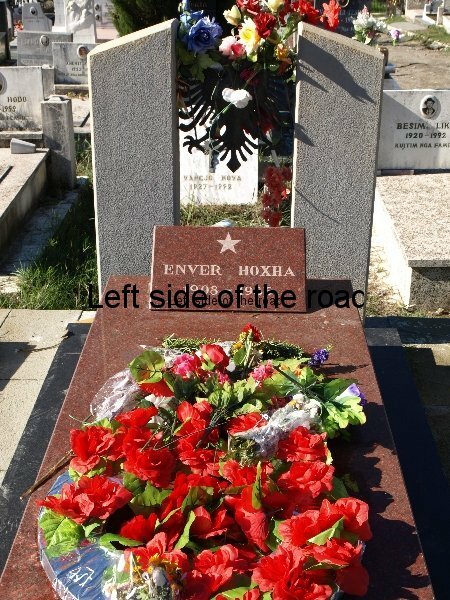 Enver’s remains were moved to the public cemetery in Kombinat in April 1992 from its location in the Martyrs’ Cemetery that looks down on the city of Tirana, in the north-west of the city, beside the road to Elbasin. Even in its original setting the grave wasn’t ostentatious. It was a bigger piece of marble but the inscription was no different. What made it special was its location, the Martyr’s Cemetery being the place of honour for those who died in the fight against fascism during the Second World War. This was just a spiteful, political move by those opposed to Socialism as has been demonstrated by the installation of a pro-fascist monument to the right of the Mother Albania statue. The original tomb stone was later used as the principle monument to the English military who dies fighting in Albania during the Second World War. The English Cemetery is in Tirana Park just behind the main Tirana University Building. 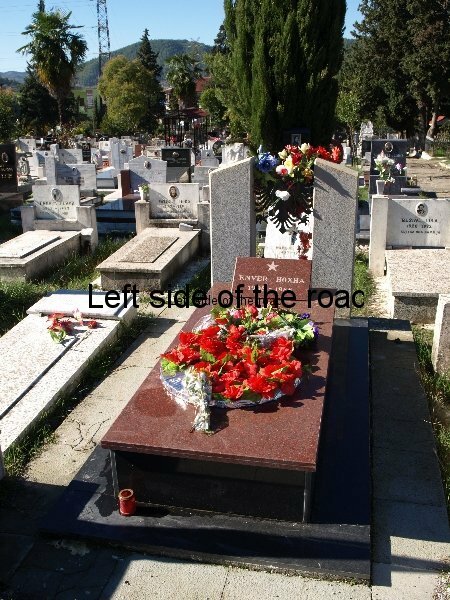 To read Enver Hoxha’s son’s (Ilir) account of the exhumation click here. Or to read that account as a Word document Lilo Hoxha on his father’s, Enver Hoxha, exhumation. The above picture was taken a few days after the celebration of Enver Hoxha’s birth, which falls on October 16th. 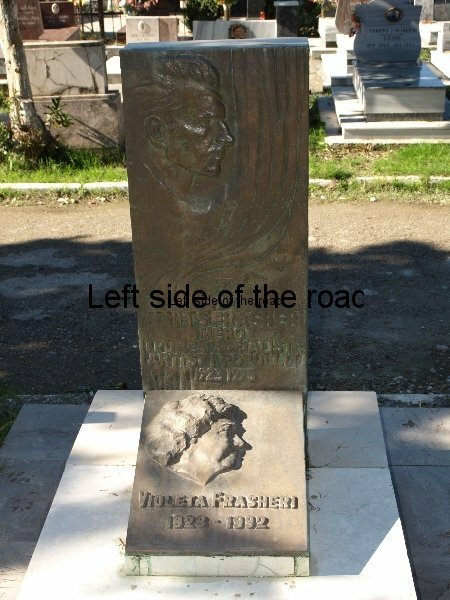 This entry was posted in Albania, History, Travel and tagged albania, communism, enver hoxha, grave, tirana, tomb by Michael. Bookmark the permalink. May he rest in hell. History has never seen such a disgusting leader, killing his own people, forbidding religion, blowing up churches. I hope someone blows up his tomb and erase him from history. Screw all of you crackhead supporters. 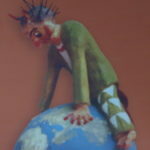 You anticommunist pig may be payed by the state and the NATO you imperialist peace of garbage. But you believing in lovely god, instead using your brain. Visiting Shok Enver’s grave is on my bucket list. (For those of you for whom English isn’t your native language, one’s “bucket list” is slang for places one wishes to visit before s/he “kicks the bucket” (dies). Many thanks for your work! We give up hope of that, as further please us with new revolutionary materials. The Georgian section of Comintern (SH) will be always glad to co-operate with you in any questions which will help approach and a fulfilment of the World Socialist Revolution! Activity of 5 Classics of Marxism, activity of the 5th Classic of Marxism – comrade Enver Hoxha – immortal! Great photos ! Congratulation ! 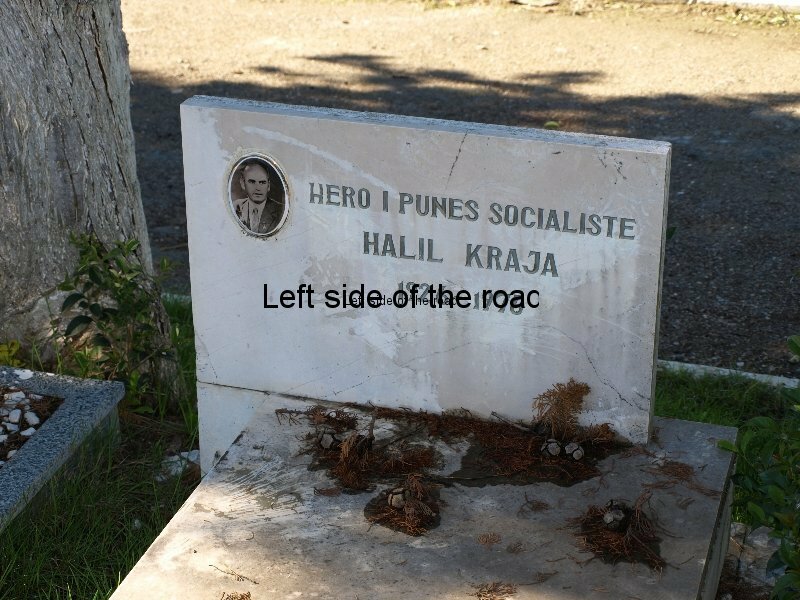 The legacy of Comrade Enver Hoxha is indelible ! 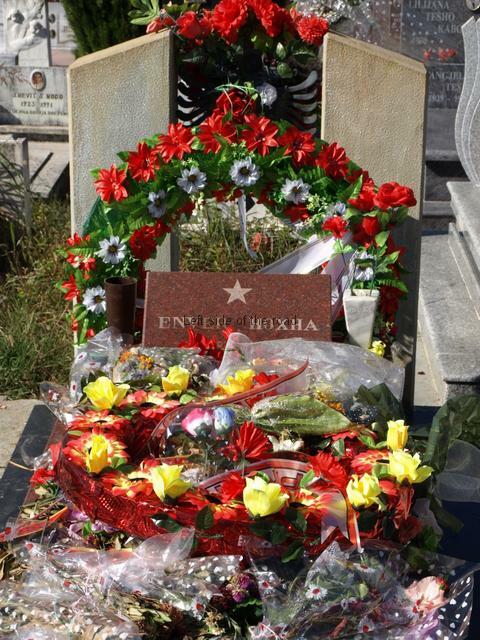 We thank you for photos of the grave of Enver Hoxha and your reportage.